Moshe Feldenkrais wrote a book called The Potent Self: A Study of Spontaneity and Compulsion. In his “Awareness through Movement” classes (the Feldenkrais Method) you can discover where you body has become inhibited and thus lacks a full range of movement. Using Feldenkrais’ techniques you can eventually regain most or all of that potential. For instance, if you ever broke a leg, your body compensated for the injury. After healing, your body may have become unconsciously habituated to some of that compensation, limiting your range of motion. In his book, Feldenkrais draws parallels with how the same thing occurs in our minds and attitudes. If you were told to always be polite, then you no longer have a full range of possible responses, so it may be difficult to say no. If you feel inhibited asking for what you really want, then your potency is compromised. Use this spread, which is based on recommendations in The Potent Self, to explore inhibitions and impotencies of which you may not be fully aware. Be playful when interpreting the cards, looking for literal clues as well as puns and metaphors in the cards you draw. This is a wonderful spread to use with the Osho Zen Tarot, though any deck will work. Read all cards as if they were upright but explore a full range of the card’s possibilities. For instance, the Sun ranges from joy to burn out. Shuffle the deck making sure you will obtain reversed cards. Cut and restack in a new order. 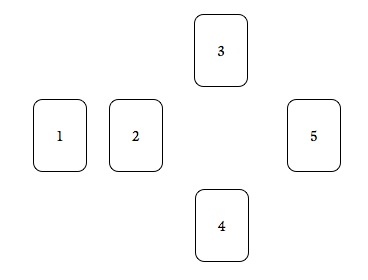 Turn over cards from the top until you get to the first reversed card. Put this in Position 1. Card 1: Where am I feeling impotent or inhibited? This describes the situation or issue where your full potential is restricted. Briefly shuffle all cards except that in Position 1. Spread them face down in a fan on the table. Use your intuition to select cards for the remaining positions from anywhere in the fan. Card 2: What is inhibiting the proper function and thus causing the impotency? Note: this may have been an appropriate response in the past but is now merely a compensatory habit. Card 3: What will come from becoming more potent? Brainstorm as many possibilities as you can, including difficult ones. Card 4: What will come from not becoming more potent, that is, staying the same or getting worse? Include the absolutely worst case scenario suggested by this card. Card 5: What action is needed? What kinds of things does this card suggest that you do? Pick one and do it. Wow. I did this last night. I rarely use reversals any more so this was very challenging for me. Using the Fenestra Tarot, my blocked card was the Moon Rx which made a great deal of sense to me. I’m going to blog about the whole spread (and directing folks back this way) over the weekend. I had two upright that were in the three and five positions. The three was the Sun. So this spread went in my personal journal for future use! Thanks so very much for sharing your wealth of knowledge, Mary. So glad you liked the spread. Be sure to let us know when you post it. Mostly the reversals are just used to determine the first card. From that point on you can choose to read the cards from just their upright positions – focusing instead on the more problematic aspects of the card in Positions 2 & 4 and the most positive/active characteristics in Position 3 & 5. Sometimes a reversal, though, can indicate a more inner or private experience rather than an outer, publicly recognizable one. Thanks for the link. It’s a wonderful example. I hope everyone checks out your reading. I love it when the cards are so literal! I am doing a reading for a client today and this spread will be a perfect follow up for her soul/personality and year card readings as we brain storm answers for her. I’m delighted this spread is working so well for you all.